Thảo luận trong 'ENGLISH' bắt đầu bởi Graham Sheldon, 17/4/19 lúc 06:53. I reviewed the Velvet Light 2 late last year and found lots to love about that particular soft bi-color high output LED panel. At NAB this year, we caught up with the Velvet Light (formerly called “The Light”) team to check in on a new 2×1 prototype, Velvet Light EVO, and find out what their new color panel lights have to offer gaffers and cinematographers. 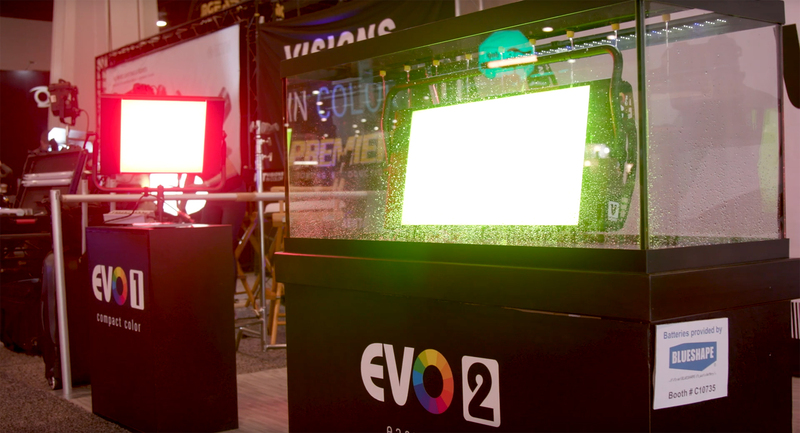 Velvet Light, based in Spain, showed off their 1×1 EVO, 2×1 EVO and 2×2 EVO at NAB this year and even displayed their 2×1 EVO in a fish tank. While not fully submerged, the point was made: these sturdy IP54 grade lights seem built to take some punishment in the field. We don’t have detailed specs available yet for the EVO 2×2 or 1×1 – so we’ll dive into a bit more detail on the EVO 2×1 in this article. The 95 CRI 200W Velvet Light 2×1 has a beam angle of 115 degrees and the color temp is continuously adjustable from 2500K to 9,999K. Velvet Light estimates the full life of the light being in the realm of 50,000 hours. At a weight of 16.7lbs, the 2×1 EVO is quite a bit lighter than the ARRI Skypanel S30, which weighs in at 31lbs. A bunch of color control modes are available, including CCT, HSI, GEL, RGB+W+CW and you also get an Effects mode with a variety of programmable effects for those rare flashing cop car or fire light moments in a scene. Beyond that, the light output is fully dimmable from 0 to 999. You can control the light through a color display directly on the body of the light or through 5-pin DMX-RDM, mini-USB, ArtNet, Lumen Radio wireless DMX or a free App called: Goya. Available on iOS or Android, you can use color picking tools (taken from photo or video) and use a 360 color wheel to really fine tune the color being emitted from the panel. Of course, minusgreen and plusgreen tuning is also available in the light. The 2×1 Velvet Light EVO doesn’t contain a fan and is cooled passively, making it friendly to the audio mixer crowd out there. Given the construction and long estimated lifetime, this seems like a light that might be useful for both, owner operators and rental houses. We’ll reserve judgement until we get our hands on a Velvet Light EVO for a review, but this seems like a very promising color panel option. The post Velvet Light EVO – 2×1 Color Panel appeared first on cinema5D.